Many tasks you perform in Excel involve comparing data in different cells. For this, Microsoft Excel provides six logical operators, which are also called comparison operators. This tutorial aims to help you understand the insight of Excel logical operators and write the most efficient formulas for your data analysis. A logical operator is used in Excel to compare two values. Logical operators are sometimes called Boolean operators because the result of the comparison in any given case can only be either TRUE or FALSE. Six logical operators are available in Excel. The following table explains what each of them does and illustrates the theory with formula examples. Equal to = =A1=B1 The formula returns TRUE if a value in cell A1 is equal to the values in cell B1; FALSE otherwise. Not equal to <> =A1<>B1 The formula returns TRUE if a value in cell A1 is not equal to the value in cell B1; FALSE otherwise. Greater than > =A1>B1 The formula returns TRUE if a value in cell A1 is greater than a value in cell B1; otherwise it returns FALSE. Less than < =A1<B1 The formula returns TRUE if a value in cell A1 is less than in cell B1; FALSE otherwise. Greater than or equal to >= =A1>=B1 The formula returns TRUE if a value in cell A1 is greater than or equal to the values in cell B1; FALSE otherwise. Less than or equal to <= =A1<=B1 The formula returns TRUE if a value in cell A1 is less than or equal to the values in cell B1; FALSE otherwise. It may seem that the above table covers it all and there's nothing more to talk about. But in fact, each logical operator has its own specificities and knowing them can help you harness the real power of Excel formulas. =A1=B1 Returns TRUE if the values in cells A1 and B1 are the same, FALSE otherwise. =A1="oranges" Returns TRUE if cells A1 contain the word "oranges", FALSE otherwise. =A1=TRUE Returns TRUE if cells A1 contain the Boolean value TRUE, otherwise it returns FALSE. =A1=(B1/2) Returns TRUE if a number in cell A1 is equal to the quotient of the division of B1 by 2, FALSE otherwise. You might be surprised to know that the Equal to logical operator cannot compare dates as easily as numbers. For example, if the cells A1 and A2 contain the date "12/1/2014", the formula =A1=A2 will return TRUE exactly as it should. However, if you try either =A1=12/1/2014 or =A1="12/1/2014" you will get FALSE as the result. A bit unexpected, eh? The point is that Excel stores dates as numbers beginning with 1-Jan-1900, which is stored as 1. The date 12/1/2014 is stored as 41974. In the above formulas, Microsoft Excel interprets "12/1/2014" as a usual text string, and since "12/1/2014" is not equal to 41974, it returns FALSE. Note. The DATEVALUE function needs to be used with other logical operator as well, as demonstrated in the examples that follow. The same approach should be applied when you use Excel's equal to operator in the logical test of the IF function. You can find more info as well as a few formula examples in this tutorial: Using Excel IF function with dates. Using Excel's Equal to operator with text values does not require any extra twists. The only thing you should keep in mind is that the Equal to logical operator in Excel is case-insensitive, meaning that case differences are ignored when comparing text values. For example, if cell A1 contains the word "oranges" and cell B1 contains "Oranges", the formula =A1=B1 will return TRUE. Note. If you want to compare the length of two text values, you can use the LEN function instead, for example =LEN(A2)=LEN(B2) or =LEN(A2)>=LEN(B2). When writing an 'equal to' logical expression that compares a Boolean value and a number, you need to specifically point out for Excel that a non-numeric Boolean value should be treated as a number. You can do this by adding the double minus sign in front of a Boolean value or a cell reference, e. g. =A2=--TRUE or =A2=--B2. Note. You should add the double unary operator before a Boolean when using other logical operators such as not equal to, greater than or less than to correctly compare a numeric and Boolean values. When using logical operators in complex formulas, you might also need to add the double unary before each logical expression that returns TRUE or FALSE as the result. Here's an example of such a formula: SUMPRODUCT and SUMIFS in Excel. You use Excel's Not equal to operator (<>) when you want to make sure that a cell's value is not equal to a specified value. The use of the Not equal to operator is very similar to the use of Equal to that we discussed a moment ago. The results returned by the Not equal to operator are analogous to the results produced by the Excel NOT function that reverses the value of its argument. The following table provides a few formula examples. =A1<>B1 =NOT(A1=B1) Returns TRUE if the values in cells A1 and B1 are not the same, FALSE otherwise. =A1<>"oranges" =NOT(A1="oranges") Returns TRUE if cell A1 contains any value other than "oranges", FALSE if it contains "oranges" or "ORANGES" or "Oranges", etc. =A1<>TRUE =NOT(A1=TRUE) Returns TRUE if cell A1 contains any value other than TRUE, FALSE otherwise. =A1<>(B1/2) =NOT(A1=B1/2) Returns TRUE if a number in cell A1 is not equal to the quotient of the division of B1 by 2, FALSE otherwise. =A1<>DATEVALUE("12/1/2014") =NOT(A1=DATEVALUE("12/1/2014")) Returns TRUE if A1 contains any value other than the date of 1-Dec-2014, regardless of the date format, FALSE otherwise. =A1>20 Returns TRUE if a number in cell A1 is greater than 20, FALSE otherwise. =A1>=(B1/2) Returns TRUE if a number in cell A1 is greater than or equal to the quotient of the division of B1 by 2, FALSE otherwise. =A1<DATEVALUE("12/1/2014") Returns TRUE if a date in cell A1 is less than 1-Dec-2014, FALSE otherwise. =A1<=SUM(B1:D1) Returns TRUE if a number in cell A1 is less than or equal to the sum of values in cells B1:D1, FALSE otherwise. When comparing text values, Microsoft Excel ignores their case and compares the values symbol by symbol, "a" being considered the lowest text value and "z" - the highest text value. So, when comparing the values of "apples" (A1) and "bananas" (B1), Excel starts with their first letters "a" and "b", respectively, and since "b" is greater than "a", the formula =A1>B1 returns FALSE. If the first letters are the same, then the 2nd letters are compared, if they happen to be identical too, then Excel gets to the 3rd, 4th letters and so on. For example, if A1 contained "apples" and B1 contained "agave", the formula =A1>B1 would return TRUE because "p" is greater than "g". At first sight, the use of comparison operators with text values seems to have very little practical sense, but you never know what you might need in the future, so probably this knowledge will prove helpful to someone. In real work, Excel logical operators are rarely used on their own. Agree, the Boolean values TRUE and FALSE they return, though very true (excuse the pun), are not very meaningful. 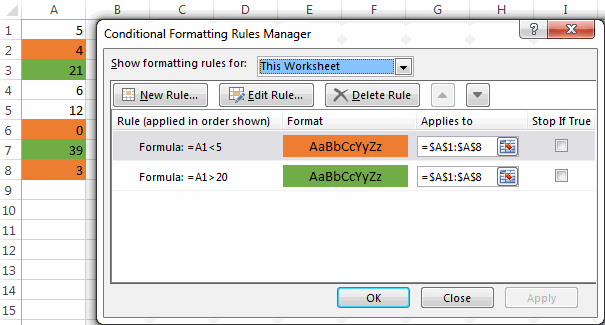 To get more sensible results, you can use logical operators as part of Excel functions or conditional formatting rules, as demonstrated in the below examples. This simple IF formula returns OK if a value in cell A1 is greater than or equal to a value in cell B1, "Not OK" otherwise. The formula compares the values in cells A1 and B1, and if A1 is not equal to B1, the sum of values in cells A1:C1 is returned, an empty string otherwise. Excel logical operators are also widely used in special IF functions such as SUMIF, COUNTIF, AVERAGEIF and their plural counterparts that return a result based on a certain condition or multiple conditions. I guess the IF formula is easier to interpret, right? It tells Excel to multiply a value in cell B2 by 10 if B2 is greater than C2, otherwise the value in B1 is multiplied by 5. Now, let's analyze what the 2nd formula with the greater than and less than or equal to logical operators does. It helps to know that in mathematical calculations Excel does equate the Boolean value TRUE to 1, and FALSE to 0. Keeping this in mind, let's see what each of the logical expressions actually returns. Obviously, if a value in cell B2 is less than in C2, then the expression B2>C2 evaluates to FALSE (0) and B2<=C2 to TRUE (1), meaning that the reverse of the described above will occur. Another common use of logical operators is found in Excel Conditional Formatting that lets you quickly highlight the most important information in a spreadsheet. As you see, the use of logical operators in Excel is intuitive and easy. In the next article, we are going to learn the nuts and bolts of Excel logical functions that allow performing more than one comparison in a formula. Please stay tuned and thank you for reading! 952 Responses to "Excel logical operators: equal to, not equal to, greater than, less than"
The formula you offered of course works on that cell, thank you! But I am wondering if I have a whole column of say 3000 entries in column A with say 50 different words that I am looking to label, the IF statement will get very long. Excel suggests to use IFS statements instead of IF statements, but as you say, you can't use an IFS statement when searching for a substring. I did some research and found that this explains it very well using an array. I have an IF statement that looks at one cell and depending on what "class code" I have in that cell it refers to another cell then adds that number into the calculation. This is working fine but I want it to then put 0 instead of a negative number. I tried adding If(<0,0,) but it is not working and I have tried several variations of less than zero. Any suggestions? Can you post the formula that was working? Amount Amount Fixed Minimum and Maximum"
then it shows whatever is there in A1 . But if A1 is blank then its showing 0 instead of blank. if a1 is greater than or less than b2 by more than 5% then colour cell? Any help would be greatly appreciated. I have a column that has taken the difference between two columns. What is the easy way to look at any difference more than a certain amount - whether that be negative or positive? It says, if the value in A2 is less than 15 then display "Less Than 15" otherwise display "More Than 15". If I got many data to lookup, how to enter the data by using if formula? Que. If A1>B1 & C1=D1 then bonus will be (A1*0.002), but If A1>B1 & C1=D1 and F1>G1 & H1=I1 then bonus will be ((A1+F1)*0.002*2). Please suggest correct formula to be used? I need a formula that figures out how many entries in a range and then divides by that about of entries. Example if A1= 0, A2, = 3, A4=5 then divide by 2. Thank you for your help. I actually have 7 entries - 1 for each day of the week, and want to divide only by the days that actually have a number greater than 0. So what I need is the sum of the 7 days then divide by only the number that had an actual value greater than 0. First I want to mention that I respect if you do not have the time to help and since you actually are making an income working with Excel I understand if you do not are able to help out. I have searched on Internet "everywhere, but do not find the correct "programming" that works for me in my Excel sheet. To start with, I work with time and a sheet using 24 hour and beyond this. Time can start at 21:00 and finish at 28:00 or 14:30 ending at 25:20 (that is the data I have (working hours and the extra amount of money we get working late)). The rules I try to set is to find time that passes 19:00 and ends before 30:00 (06:00). Also I want to know if how much time is between 19:00 - 22:00 and how much is between 22:00 and 30:00. For an example working hours are 14:00-23:30. Then we get three hours of extra payment between 19:00-22:00 and a higher amount of money between 22:00-23:30. But we do not get paid that extra money, below I have added a break between 18.30-19:30. First I want to extract the 19:30 into one cell, 22:00 to the next, after that also 22:00 separately and at the end 23:30. I have tried this, but could not make it work. Will this take to much time to write formulas that makes this work? I have searched on Internet "everywhere", but do not find the correct "programming" that works for me in my Excel sheet. I have a data four cell in excel now i want to summation both of data but if i input one cell less then 9 or equal to any character the output will be zero. How can i solve this issue. plzz do the ans for the question. I have two results in excel: 37.9%	and 29.8%, how to type formula to say that if both of them are within 1% then report mean, if the difference is greater then the preferred result is taken as lower of the two values. I am trying to convert positive $ value to negative value if that positive value for an account number greater than 4 but less than 5. Can you please let me know what formula can I use to get that result? My case is for my item analysis in school. Can you help me to create a formula for this case. Thank you. How do i go about this; I am using this function =IF(I7=1,"NPE",IF(I7=2<2.9,"BAE",IF(I7=3<3.9,"AE",IF(I7=4<4.9,"SE",IF(I7=5,"EE",))))) and i am getting '0' as the 'value if true'. Pls help. If in a row a value is 9 in column c, then come to 15 in column d, if it is 22 in column c, then come to 22 in column d and if 45 in column c, then come to 30 in column d. how and what formula, i can use for it. I need a help regarding the issue. I must have missed some basic rules and get the error. Looking for your kind assitance to advise the correct method. I'm trying to make a formula for if B3 is > 0= "Post Firm" , B3 is <0 = "PRE FIRM"
Basically if its less than zero PRE FIRM, greater than 0 POST FRIM will populate. I need to create a formula Like. If cell2 value is greater than 50% of cell1 value. Like cell1 value is 20 and if cell2 value is greater than 10 (which is greater than 50% of cell one value) then it says yes. Kindly assist me.